There’s a lot that goes into playing a church organ. There are one or more keyboards to manage, a series of stops to survey, and pedals to push. On top of all of this, you also have to keep in mind how you are seated at the organ. Yes, as a church organ player, you wouldn’t want something as simple as sitting to be easy would you? Fortunately, Whitesel Church Organs is here to help. 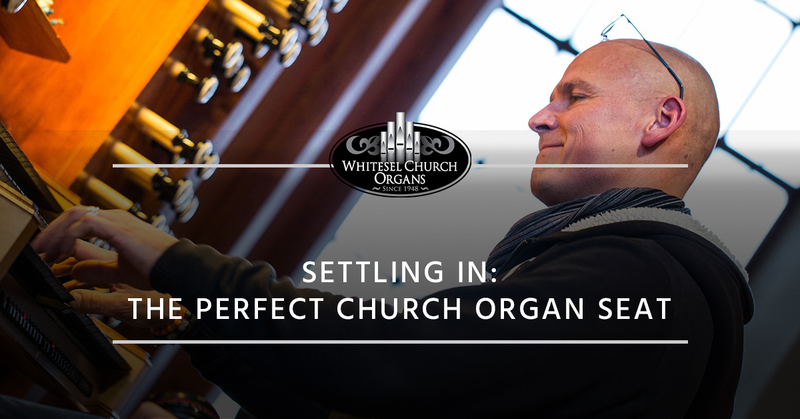 We want every organ player to grow and develop into a fine performer and to help you along the way, we’ve put together this quick guide on how to properly sit at the organ. Much like everything else church organ related, the bench at the organ is specially designed for playing the organ, and can be adjusted to match the height of the performer. They are typically as wide as the console itself, allowing the performer to move back and forth across the bench as needed to reach every key and stop. When positioning yourself on the bench, you should keep a few things in mind. The proper arm position for playing the church organ requires you to keep your arms close to the body, with your wrists in line with the rest of your forearm. This allows you to quickly and precisely move between manuals. While piano players keep their arms away from their body, this is because playing piano requires them to leap from various positions across the keyboard. Organs are not set up this way, so having your arms away from your body can actually slow your playing down. A church organ will also have foot pedals that play notes in the lower register. Adjust your bench so that the distance from the pedals so that your toes should brush the tops of the sharp keys. This allows you to move easily between pedals and play them easily when needed. Typically, you’ll sit closer to the organ than you would at a piano. This is so you can reach the pedals easily. Your parents probably belabored the need for good posture, who knew they were talking about organ playing! Like good posture in standing and sitting in general, good posture at the organ bench is based on how you position your back, head, and shoulders. Good posture at the organ bench has you seated with your head over your shoulders. Your ears should be aligned with the top of your shoulders, so your neck shouldn’t be leaning forward over your shoulders. You’ll want to sit with your breastbone up as if you’re puffing your chest out slightly. Finally, pull your shoulder blades back just a little bit. The importance of proper posture and seat position at the church organ bench cannot be understated. It helps you play the organ more effectively and allows your arms and legs to easily reach the manuals and pedals without straining your body. Proper posture also helps you play for longer periods. So the next time you’re playing a 20-minute long concerto, you’ll find yourself feeling fresh and relaxed when you step off the bench. If you’re in need of church organ repairs on the East Coast, don’t hesitate to call your repair experts at Whitesel Church Organs. We offer everything from minor repairs to complete rebuilds and everything in between. Contact us today to schedule your services.